Do you read the Bible daily? Weekly? Monthly? Would you like to read it, but can’t find the time? Have you started reading it only to give up after a couple of weeks? 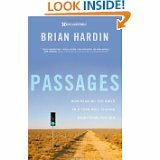 Brian Hardin knows just how you feel. Through this easy to read book with humor sometimes and heart tugs at others, he encourages you to give reading the Bible another try. It will change your life forever. Brian initially was very involved in the music business in Nashville, Tennessee. He had grown up the child of a minister and sworn he would never enter the ministry. He was a Christian at a young age, but saw how some Christians behaved toward him and others that certainly wasn’t Christ like. He wanted no part of that, only his music. Well, the stress of this world took its toll and soon Brian found himself at the end of his rope so to speak. He was willing to give the Bible one more shot before turning his back once and for all. He is now an ordained minister. He has now read the Bible every day for over six years out loud on a Podcast he created with discussion following and then prayer to close. Millions listen to his Podcast as he reads through the Bible. Several people are quoted in his book as to the life-changing power of Scripture and how reading it every day keeps them anchored in their faith. It also gives a sense of fellowship and community, a sense of belonging as everyone is reading the same passage together. The website is www.dailyaudiobible.com if you want to check it out. He proposes that the Bible was never meant to be read in small snippets here and there, but in sizable chunks daily with time for thinking about what you’ve read. He also lists the benefits of reading the Bible in community and out loud. God spoke the world into existence. There is power in the spoken word as we’ve all experienced be it good or bad. He tells of how when he looked in the mirror after the first year of reading through the Bible, he didn’t recognize the man looking back at him. The Bible had changed him from the inside out. He was a different person. You must make the time to read the Bible as these are the very words of our Creator, our God. Can’t we find time for Him? The last 60 pages are three different reading plans to help you get started on reading the Bible through daily in one year. Will you make the commitment to make God’s Word a part of your life every day for the next year? Will you look in the mirror in a year and know yourself? My rating for this book is four stars.